California’s Crescent Shield seems to be a band among the several revivalists of the new era, resurrecting the glory days of metal from the mid-80s, with little refinements to an already established sound – which is perfectly fine if you’ve got the hooks and chops to back the recycling up. The singer, Michael Grant, sounds to me a bit like Geoff Tate from the early years of the ’Ryche, when the man hadn’t quite yet grasped the emotion and sense of drama that he had during his best years. Grant has got it in range but needs more experience under his belt to sound more confident. There are plenty of gang choruses and backups in the vocal sections which are often a bit thin and fall short of their apparent purpose to beef up the sing-along parts. The musical muscle of Crescent Shield is built on a solid rhythm section which comes through well with the usual double-bass runs and rumbling drumrolls. The guitar riffs are basic-fare heavy metal that keep a nice, moshable action alive but often lack the memorable quality of masterpieces. Rise Of The Red Crescent Moon, with its fist-banging churn reminds me instantly of Iron Maiden’s most glorious mid-tempo moments, like Revelations. Needless to say, the abundance of guitar harmonies spread throughout is pretty much from the Maiden playbook. The title track is an epic, 7-minute, acoustic-intro-equipped gem, which rises above the rest of the album. The solos in the intro and outro have some nice, melodic emotion in them. The Path Once Chosen also fares well with a very infectious chorus and an ever-growing harmonized solo. The folky acoustics in The Passing are a nice touch. The lyrical side of the album often goes into hilariously boastful metal warriordom. Although not full-blown Manowarish in their machismo, one could definitely down several pints along to these tunes. The production is the weakest point on the album. Much more boom and bass would be needed for straight-up metal like this, especially with the drums. Right now the whole record sounds a lot like a very well-made demo, with the vocals much too loud in the mix. 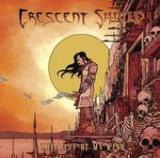 Crescent Shield has potential to make solid heavy metal that any fan of standard-fare craftsmanship should appreciate. Yet the score isn’t getting higher as there isn’t much on The Last Of My Kind that would urge me to listen to it repeatedly.